(CNN) -- With the West posting the highest regional rate of unemployment, at 8 percent, according to the latest government figures, people living there are hurting to find employers willing to take them in. 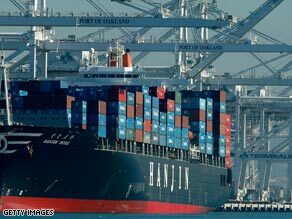 The Port of Oakland, in California, will see 6,000 new jobs, thanks to a $150 million deal. The Bureau of Labor Statistics reported in January, after crunching December 2008 numbers, a 2.9 percent regional bump in unemployment from the same time in 2007. California, in the last month of 2008 alone, lost more than 78,000 jobs, outpacing any other state. But while California, Nevada and Oregon posted jobless figures, respectively, of 9.3, 9.1 and 9.0 percent, other Western states appeared more stable. Wyoming's latest figure of 3.4 percent unemployment was better than any other in the nation, and Utah came in at No. 5, with an enviable rate of 4.3 percent. Affiliates working with CNN, meantime, are looking out for signs of promise -- giving viewers and readers insights into where some of the jobs are. Wanting to soak up some of the steady rays, Schott Solar, a glass company that works in the solar power business, is bringing green jobs to Mesa Del Sol in Albuquerque, KOAT reported. The $100 million manufacturing plant will bring renewable energy education to the area, as well as jobs, which will number 170 by September, the station reported. The Port of Oakland is set to get a windfall investment of $150 million, which will bring with it about 6,000 new jobs, KTVU reported. A 50-year deal for a five-berth project was announced Wednesday by Ports America, which will install new cranes as well as environmental upgrades, the station said. It turns out the new M Resport Spa Casino in Las Vegas is short-staffed and needs to immediately hire 250 more employees, KTNV reported. And across the border in Colorado, the Golden Casino Group is putting on the Black Hawk table positions for 90 new dealers, no experience necessary, KUSA reported. A chemical company based in Japan recently announced plans to expand its investment in Vancouver, where it's already one of the city's largest employers, KPTV reported. Mayor Royce Pollard told KPTV about an early February visit he and the city manager took to Japan, where they met SEH executives and learned of the company's plan to double the size of Vancouver's SEH America plant. The upgrade could amount to a several-hundred-million-dollar investment, as well as new jobs, the mayor told the station.